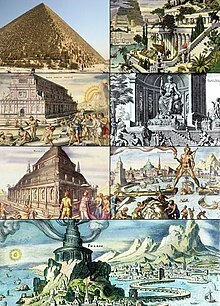 ↑ Hereward Carrington (1880–1958), "The Seven Wonders of the World: ancient, medieval and modern", reprinted in the Carington Collection (2003) ISBN 0-7661-4378-3, C&pg=PP15&dq=Carrington+Collection+Seven+Wonders+of+the+Middle+Ages&hl=en&sa=X&ei=cgY-T-3JGsqMiAK21_mgAQ&ved=0CDwQ6AEwAA#v=onepage&q&f=false page 14. ↑ Edward Latham. A Dictionary of Names, Nicknames and Surnames, of Persons, Places and Things (1904), dm2PkC&pg=PA280&lpg=PA280&dq=%22seven+wonders+of+the+middle+ages%22 page 280. หน้านี้แก้ไขล่าสุดเมื่อวันที่ 16 เมษายน 2562 เวลา 18:43 น.